Hemp is the future, according to North Omaha Senator Justin Wayne. His bill LB 657, the Nebraska Hemp Farming Act, would align state laws with the federal 2018 Farm Bill that legalized the cultivation, harvesting, handling, marketing and processing of hemp, the non-psychoactive form of cannabis. “We’re looking to decriminalize it and we’re looking to create a regulatory system that meets the 2018 Farm Act and we’re looking to hopefully do seeds this year, if I can get this moving fast enough, and next year have full blown hemp going. And see now, if we start planting then we get to go out and start recruiting the manufacturers,” said Wayne. Wayne explained that hemp, which is estimated to be a billion dollar industry, is not only a money making crop for farmers, but also an opportunity for new good paying jobs in rural and urban areas where older industries have died. “If we were to have a massive hemp production in Nebraska, we can create massive amount of jobs in and around I-80 corridor including Omaha,” said the senator. “Farmers have been losing 50 cents or more per bushel of corn over the last 3 years,” said farmer Bill Hawkins, founder of the Nebraska Hemp Company (NHC). Hawkins has been advocating for industrial hemp legalization since 2014 after the federal Farm Bill of that year allowed states to conduct hemp research. NHC is an education and research non-profit focused on the applications of hemp in Nebraska. Wild Hemp plant in wooded area of rural Nebraska. An organic farmer for 40 years and herbalist, Hawkins sees hemp as a way to boost Nebraska’s economy and generate opportunity for people suffering land and job loss. “This plant will allow cottage industries to develop, creating sustainable markets for rural communities,” said Hawkins. He described textiles for clothing and the the growing cannabidiol (CBD) industry as major players for local markets. Quotes for CBD market growth by 2022 see anywhere from $646 million, according to Hemp Business Journal, to a whopping $22 billion per the Brightfield Group. An amendment to remove industrial hemp, and its derivatives including CBD, from a list of controlled substances has been added to LB 657 which would make the sale of CBD completely legal in the state. According to a 2018 memo from Attorney General Doug Peterson, “any product containing cannabidiol, obtained by any means other than the authorized UNMC study, remains illegal to possess, manufacture, distribute, dispense,” despite many local shops already carrying and advertising the acclaimed health benefits of the compound. An emergency clause in the bill would immediately legalize CBD once signed by the governor. When asked if hemp could help people impacted by the flood Hawkins relented, “That’s something that Senator [Lynne] Walz in Fremont, [and] I’ve had some discussions with her office. Hemp has an ability to [act] as a soil remediator which means it can pull toxic chemicals, heavy metals, and stuff out of the soil,” he said and later suggested that the plant could be used as a cover crop in areas with possible contamination from flood waters. After years of educating senators through NHC, Hawkins says he thinks the bill has a majority of support from the legislature,“I do not think there’s gonna be any opposition, I just don’t think so, we’ll see here,” he said. Statements from Governor Pete Ricketts to KGFW radio in Kearney suggest the executive branch is willing to work with Senator Wayne on passing the bill. “We’re working on the regulatory structure right now so stay tuned because I would expect Senator Wayne’s bill to be successful this year,” Ricketts said in February. Hawkins feels the pace at which the bill has moved has put a major delay on Nebraska farmers hoping to get a crop in the 2019 planting season, as wild hemp and other plants are already germinating. “It’s 8 weeks since it should have been out of committee. We could have already passed it in February and they could be done with rules and regulations right now and we could be into planting season,” he said. Ultimately for Hawkins he believes that the Nebraska Hemp Farming Act could be a catalyst for economic growth and sustainability for the state and its residents. “We’re struggling with farmers going into bankruptcy at an increasing rate and this hemp crop is the chance to save the family farm,” said Hawkins. These Pamphlets do not credit SAM Nebraska but related posts on Facebook show the organization sharing similar information. 37 Senators vote to advance LB 657 on to two more rounds debate. Photo taken by Senator Anna Wishart. Floor debate for the Nebraska Hemp Farming Act was scheduled for the week of April 20. 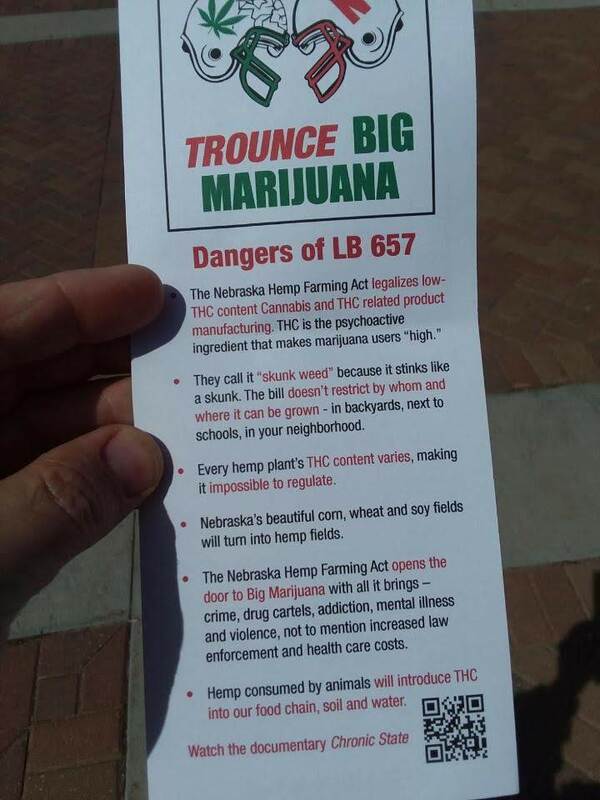 The weekend prior to floor debate for the bill, flyers were given out during a Husker practice game from an organization called Smart Approaches to Marijuana (SAM) Nebraska that shared anti-hemp legalization statements and recommended constituents tell their senators to vote “NO” on LB 657. The bill will have to pass two more rounds of debate before going to the governor’s desk.